Sanitation workers take center stage as a modern dance ensemble, inspire audiences. The debut performance of “The Trash Project.” Photo by Andrew Garrison. “This lady’s crazy. How are we going to make trucks dance?” exclaimed gap-toothed sanitation worker Don Anderson when he heard about choreographer Allison Orr’s idea. 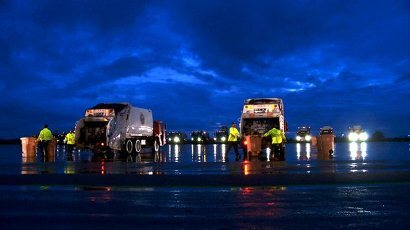 What Orr had in mind for the Solid Waste Services Department of Austin, Texas, was a “trash truck ballet,” one which would feature the choreographed movements of sixteen garbage trucks and twenty-four employees. Predictably, the sanitation workers weren’t the only ones who were skeptical. The concept was publicly ridiculed, and critics claimed the project would be a waste of the taxpayers’ finite resources. Orr was unfazed. “When I bring any of my ideas to anyone, the first reaction is: ‘What are you talking about? There is no way this will work. Nobody will want to participate.’ I am used to people giving me a negative response,” she says. 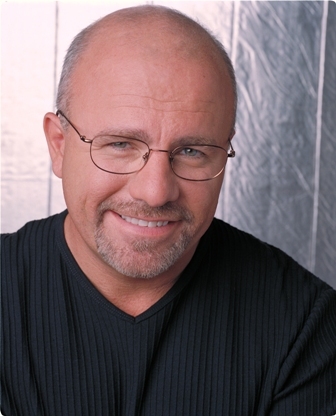 But Orr ultimately achieved buy-in from all parties, and each of three public performances (one in 2009, and two in August 2011, all at an abandoned airfield in Austin) were wildly successful, witnessed by capacity crowds of up to two-thousand people and drawing rave reviews in the local media. Today, the inspiring story of the creation of “The Trash Project: An Evening of Dance” can be seen by all, thanks to independent filmmaker Andrew Garrison and his documentary, Trash Dance, which, not surprisingly, has become a favorite of sanitation workers nationwide. One of the first challenges Orr faced was to interest the workers in taking part in the project, which required volunteering untold hours to create, rehearse, and publicly perform a complicated “dance” routine, all while wearing their work clothes and reflective yellow vests. Never mind that choreographing the interplay between the garbage trucks would require them to spend that much more time in the dirty, smelly vehicles they drove around in all day at work. But Orr — artistic director of Forklift Danceworks, the dance company she founded in 2001 — was convinced the concept was a winner. “I often work with people you don’t typically think of as dancers,” she begins, referring to the firefighters, maintenance men, and Venetian gondoliers she has collaborated with in the past. “I am really interested in the movement that comes from daily life and work [and using that] as inspiration for choreography,” she continues. Fortunately for Orr, she has a gift for getting people to interface with one another, and over time she got the mostly hesitant workers to commit to the project — and each other. “They recognized — more than any other group I’ve worked with — that the public doesn’t know what they do, that their work is underappreciated, and that it was an opportunity to tell their story,” she says. As a result, Orr made sure to incorporate many of the moves the workers make on a daily basis, hence the carefully orchestrated raising, emptying, and lowering of trash and recycling containers, not to mention the extended “crane solo” — all performed to music scored by composer Graham Reynolds. More importantly, she also gave participants a chance to display some of their hidden talents, like break dancing, rapping, and playing the harmonica, further humanizing the workers, who appreciated the opportunity to step into the spotlight and shine. Garrison echoes Jackson’s sentiment: “Participating together changed how [the workers] knew each other and the relationship with their customers. After [the film was released] people on their routes would leave water out. They would come out and say hello. 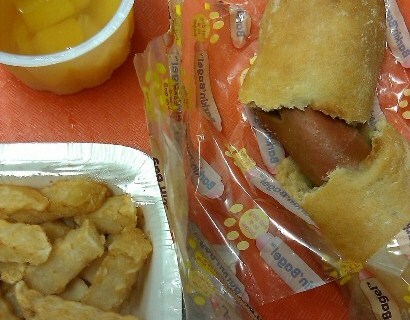 Previously all they would get is complaints,” he says. 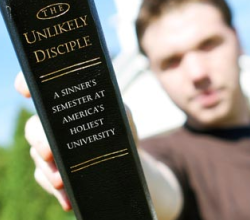 The Unlikely Disciple—Kevin Roose’s unholy semester at Liberty University. Charleroi: Wish You Were Here?—Eccentric artist offers guided tours through a city that’s been called the ugliest in the world.